On Nov. 6, 2018, Pennsylvanians went to the polls to elect a governor and their representatives to U.S. Congress and the state General Assembly. A redrawn Congressional map and an uncertain political environment made this year’s election one of the most unpredictable in a generation. Overall a total of 24 seats flipped parties and 15 incumbents who were on the ballot lost their race. On the federal level, Democrats picked up 3 congressional seats, leaving the state's delegation split 9-to-9 and increasing from zero women to four. But Republicans held on and overcame some high-profile congressional challenges. On the state level, Democrats added five seats in the State Senate and thirteen in the House. Incumbent Tom Wolf (D) was challenged by businessman and former state Sen. Scott Wagner (R). Wolf is an unabashed progressive Democrat, while Wagner’s smash-mouth brand of politics is best described as Trump-like. Neither one is a career politician: both have extensive business experience and strong ties to that community, and both have a sharp vision of the direction they want to take the state. Wolf won with 57.6% of the vote. On Jan. 20, 2015, Wolf was sworn in as Pennsylvania’s 47th governor after defeating incumbent Republican Tom Corbett. Since taking office, Wolf has focused his policy efforts on building a strong workforce, increasing funding for public education, and improving access to health care. In the key area of tax policy, Wolf has proposed in each of his four budgets a severance tax on the natural gas industry and combined reporting. Last February, as part of his 2018-2019 fiscal year budget plan, Wolf proposed a severance tax based on the volume of natural gas extracted. The proposal was sensitive to prices, with the tax rate dependent on market price. It’s unlikely that Wolf will back away from a severance tax given another term in office. Wolf has championed changing how Pennsylvania corporations file their returns with the Department of Revenue: from the current separate company reporting system to a unitary basis. Closing the “Delaware loophole,” as it has come to be known, and lowering the state’s corporate net income tax would likely remain priorities if Wolf is reelected. Wagner is not a typical politician. The unwavering conservative is not afraid to say what’s on his mind. Wagner stormed onto Pennsylvania’s political scene in early 2014 when he ran a successful write-in campaign for York’s 28th state senatorial seat against the GOP’s hand-picked candidate. Wagner has been making waves in Harrisburg ever since. His hard-charging style may have ruffled a lot of feathers in the capitol, but he has established himself as someone who is not afraid to challenge the status quo. In May, Wagner defeated Paul Mango and Laura Ellsworth to win the Republican primary for governor. Pennsylvania’s finances is job No. 1 for the next governor. Wagner points to recent studies by U.S. News & World Report and WalletHub that have found hundreds of millions of dollars in taxpayers’ money that was wasted, poorly invested, or lost. Wagner’s plan is to implement a zero-based budgeting system, which would require state departments and agencies to justify each dollar of spending every year through budget reviews. John Fetterman defeated current Lt. Gov. Mike Stack (D) in the May primary. He was elected mayor of Braddock, Pa., in 2005. Fetterman grew up in York, went to Albright College, and joined AmeriCorps, where he served in Pittsburgh’s historic Hill District helping to set up the first computer labs in the neighborhood and teaching GED classes. He went on to earn a master's degree in public policy from Harvard’s Kennedy School of Government, where he focused on finding solutions in social work, business, and public policy to confront urban challenges and economic inequality. During his 12 years as mayor, Fetterman worked to attract new residents and jobs. In November 2017, Jeff Bartos joined the Scott Wagner for Governor team as the lieutenant governor candidate and handily won the May primary. Born and raised in Berks County, he has been a Pennsylvania resident his entire life. Bartos owns a contracting company and several real estate acquisition and development companies active in the Greater Philadelphia market. He has previously served as a senior executive at Toll Brothers Inc. and Mark Group Inc. Incumbent U.S. Sen. Bob Casey (D) was challenged by mid-state Congressman Lou Barletta (R). Casey, a former state auditor general and treasurer, was seeking his third term, while Barletta, an early backer of President Trump, is the former mayor of Hazleton and four-term congressman. Bob Casey has spent two terms representing the people of Pennsylvania in the U.S. Senate, focusing on good jobs, higher wages, and fairer workplaces, and providing results for workers, women, children, seniors, and people with disabilities. He has experience and a record of successful service. Casey has dedicated his career to serving the people of Pennsylvania, having been auditor general, state treasurer, and currently U.S. Senator. In Harrisburg, Casey focused on making government more accountable and responsive to the needs of Pennsylvanians. He has worked to make nursing homes safer and to protect affordable child care. He fought to reform Megan’s Law to better protect Pennsylvania’s children and communities. U.S. Rep. Louis J. Barletta began his fourth term on Jan. 3, 2017. He is a former three-term mayor of Hazleton. He serves on three House committees: the House Transportation and Infrastructure Committee, where he serves as chair of the Economic Development, Public Buildings, and Emergency Management Subcommittee; the House Homeland Security Committee, where he serves on the Counterterrorism and Intelligence subcommittee; and the House Committee on Education and the Workforce, where he serves on both the Higher Education and Workforce Development Subcommittee and the Health, Employment, Labor, and Pensions Subcommittee. Pennsylvania’s 18 Congressional seats were up for grabs this year, the first under a redrawn electoral map. Prior to the election Republicans held 12 of the 18 districts. Of note to the PICPA is Rep. Brian Fitzpatrick, CPA, who was facing his first reelection bid for his suburban Philadelphia seat, and was victorious. 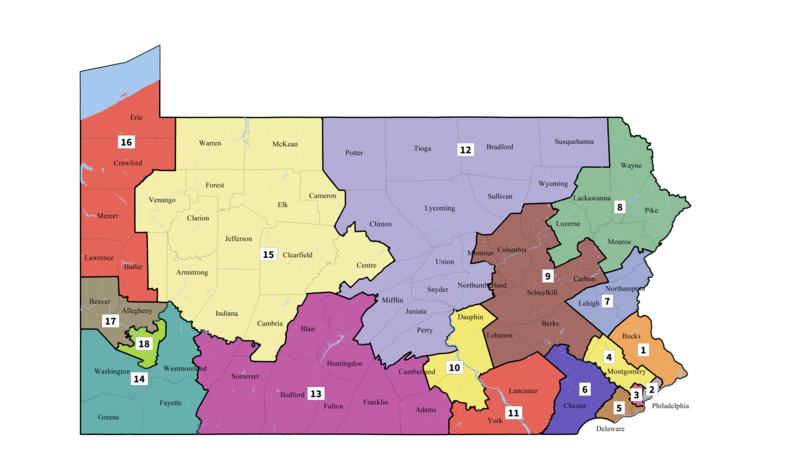 Pennsylvania had a new Congressional district map for the 2018 elections. New 1st is highly competitive and covers Bucks and Montgomery counties. New 2nd contains the eastern part of Philadelphia. The 3rd district encompasses the southern portion of Philadelphia. The 4th district covers a small southern portion of Berks and and all of Montgomery counties. Open seat covering Chester, Delaware, Montgomery, and Philadelphia counties. Open seat previously occupied by U.S. Rep. Ryan Costello (R), the new district unites all of Chester County and part of Berks. Open seat previously occupied by U.S. Rep. Charlie Dent (R), the new district is comprised of Lehigh and Northampton counties, along with roughly one-third of Monroe county. Comprises Scranton/Wilkes-Barre while covering Lackawanna, Luzerne, Monroe, Pike, and Wayne counties. Open seat previously occupied by U.S. Rep. Lou Barletta (R) covers Berks, Carbon, Columbia, Lebanon, Luzerne, Montour, Northumberland, and Schuylkill counties. New district includes all of the York and Harrisburg metro areas in Cumberland, Dauphin, and York counties. New district covers Lancaster and York counties. This new district covers 15 counties, including Bradford, Centre, Clinton, Juniata, Lycoming, Mifflin, Northumberland, Perry, Potter, Snyder, Sullivan, Susquehanna, Tioga, Union, and Wyoming. The 13th Congressional District comprises territory from six different Congressional Districts, the majority of which comes from retiring U.S. Rep. Bill Shuster (R) district, and includes Adams, Bedford, Blair, Cambria, Cumberland, Franklin, Fulton, Huntingdon, Somerset, and Westmoreland counties. Open seat formally occupied by U.S. Rep. Tim Murphy (R), the new 14th contains 57 percent of the former 18th, the electorate from which just elected Democrat Conor Lamb in a March 13 special election. The district covers Fayette, Green, Washington, and Westmoreland counties. The 15th contains 57 percent of the voters from Thompson’s previous 5th Congressional District containing Armstrong, Butler, Cambria, Cameron, Centre, Clarion, Clearfield, Elk, Forest, Indiana, Jefferson, McKean, Venango, and Warren counties. The new 16th hugs the Ohio border from Lake Erie all the way to the northern Pittsburgh suburbs, covering Butler, Crawford, Erie, Lawrence, and Mercer counties. U.S. Rep. Keith Rothfus's (R-Incumbent) new district contains 56 percent of his constituency base and 20 percent of newly elected Conor Lamb’s district, covering Allegheny, Beaver, and Butler counties. U.S. Rep. Mike Doyle's (D-Incumbent) new district includes most of the city of Pittsburgh and 76 percent of Doyle’s former constituency in Allegheny County. Sen. Pat Browne was first elected to the state Senate in a special election in April 2005, and was reelected in 2006, 2010, and 2014 to represent constituents in the 16th Senatorial District. Before being elected to the Senate, Browne represented constituents of the 131st District in the House for 10 years. He was the first Republican elected to that district. Rep. Keith Greiner has been a champion of the CPA profession as a member of the Pennsylvania House. He sponsored PICPA-proposed amendments to the Solicitation of Funds for Charitable Purposes Act, which are now Acts 71 and 72 of 2017. Greiner and the PICPA are also collaborating on legislation to address practitioners' concerns with the new 1099-MISC withholding requirement. Rep. Mike Peifer, a Greentown resident, is serving his fifth term representing the 139th Legislative District. He graduated from Rider College in 1990 with a bachelor of science degree in accounting. Peifer pursued his accounting career with Price Waterhouse LLP, qualifying as a CPA in 1991 and rising to the level of senior tax consultant. In 1995 he returned to Greentown to open his own accounting and tax firm. He was first elected in 2006. Elected to the state House in 2016, Rep. Frank Ryan is a CPA and a graduate of Mt. St. Mary’s College in Emmittsburg, Md. He received his master's of business administration from the University of Maryland. A retired Marine Reserve colonel, Ryan was recalled to active duty in December 2004 and served with Multi-National Force-Iraq until June 2005. Prior to his initial retirement in 2002, Ryan served as the Central Command Special Operations Officer during Operation Enduring Freedom. Ryan is a fiscal conservative and an expert in corporate restructurings and management. As a public servant, inactive CPA, and successful entrepreneur, Rep. George Dunbar brings a combination of real-life experience and commitment to integrity to his role as a state lawmaker. Dunbar was sworn in to serve his fourth term as state representative for the 56th Legislative District in January 2017. During the 2017-2018 session, Dunbar was appointed to serve as majority vice chair of the House Appropriations Committee. In addition, he is a member of the Commerce, Finance (vice chair), and Gaming Oversight committees. In the state General Assembly, all 203 House seats and 25 of the 50 Senate seats were on the ballot. Prior to the election Republicans currently held significant majorities in both chambers: 121 in the House and 33 in the Senate. Several PICPA members were running and were victorious, including Sen. Pat Browne, CPA (R-Lehigh), chair of the Senate Appropriations Committee, Rep. Keith Greiner, CPA (R-Lancaster), and Rep. Frank Ryan, CPA (R-Lebanon). Rep. George Dunbar (R-Westmoreland) and Rep. Mike Peifer (R-Pike, Wayne), both inactive CPAs, were also seeking reelection and were victorious.